The purpose of SoloManager is to start a target program locally and to then continuously monitor the target program's availability. The target program responds to tcp/ip queries on a specified port if it is operating normally. 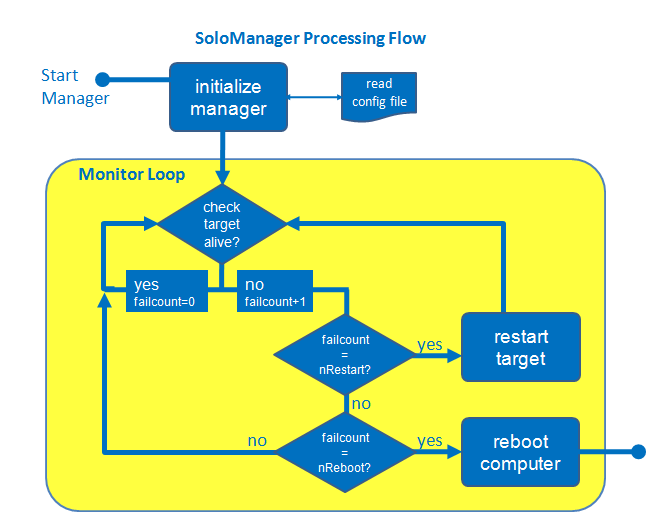 If the target program becomes unresponsive for for a specified period of time then the SoloManager can terminate it and restart it, and/or reboot the host computer entirely. Many aspects of the SoloManager program can be configured by specifying values in the SoloManager.ini text file. Note: The configuration files are contained in a folder called 'solomonitor', this is due to historical reasons. We apologize for any confusion this may have caused. This contains the SoloManager program, and a sample SoloManager.ini file. It also contains all necessary Java library files. Contains configuration details specifying how the SoloManager operates. See the example configuration file listed below. This is an the program we wish to monitor and to ensure is always available. It must expose a TCP port and respond to socket queries on that port. This is an optional component which will start SoloManager whenever the host computer is booted up. It is described in the sections below about starting SoloManager as a Service or Daemon. These components are related as shown in the SoloManager flowchart. The SoloManager is typically started automatically when the host computer is booted up, usually via the Service and Daemon Wrapper. Once started, the SoloManager begins by reading in values for all configurable parameters from the SoloManager.ini file. This file can be edited by the user to specify their preferred settings but it must be located in the same directory as the SoloManager jar file. This is where the user specified the name of the target executable which SoloManager will start and monitor, for example. SoloManager then begins its unending loop where it checks the status of the target program. SoloManager creates a socket connection to the target program and sends a query. If the target program is alive it sends a response which must match what SoloManager is expecting. Sending the parameter "msgToSocket" to the socket and verifying that the first line returned from the socket equals the parameter "expectedResponse". If the response is not valid SoloManager will repeat this check up to "fastFailCountLimit" times with a pause of "FastQueryIntervalSeconds" seconds. If the response is valid the check is complete with result success. If the target check was successful then the failure counter is reset to zero and the loop repeats after a specified pause period of "SlowQueryIntervalSeconds" seconds. If the target check was not successful then the failure counter is incremented. The loop continues until this counter reaches a specified "nResponseRestart" counter value, whereupon SoloManager issues a command to restart the the target program and continue with the loop. If the target program restarts then the next check will be successful so the loop continues normally. If the restart command does not succeed in restarting the target program then the target checks will continue failing and the failure counter incrementing until it eventually attains the specified "nResponseReboot" counter value. At this point SoloManager issues a command to reboot the host computer and the entire process begins again. SoloManager is about to issue a restart command for the target program. SoloManager is about to issue a reboot command to the host computer's operating system. Java version 1.5 or later is available on the host computer. It must be able to write to a log file on the filesystem. It must be able to issue a system reboot command (command can be defined within the configuration file). outdir Specifies the folder which should contain the log files. By default these will be written to the same folder as the configuration file, but another file may be preferable if the user does not have read/write permissions to that folder. maxTargetRunDurationHours The target will be stopped and restarted every maxTargetRunDurationHours if this is a positive number. It has no effect if it is not a positive number. The settings in the configuration file represent likely minimum settings. If longer delays are acceptable before a response, increase the fastQueryIntervalSeconds and/or the nResponse___ settings. # How many fast cycles should occur with fails before applying response for level 1, 2, etc. # maxTargetRunDurationHours. Non-positive value disables this feature. stopExecutableCommandPre = taskkill /F /IM \"
SoloManager is most useful when run automatically by an operating system. This will start the Target Application in the background. The following describes how to install SoloManager as a service (Windows) or daemon (Linux). Copy the application files onto the computer on which the application is to be run. Configure solomanager.ini as needed for the intended behavior. Copy solomanager.ini into the "service" folder. This copy of solomanager.ini will be used by the service. Run the Install_Service.bat file in the service folder to install the service (this batch file must be run by a user with administrative privileges). Note: different versions of Windows have differing levels of user access control. For example, under Windows XP it is typically sufficient to be logged in as a user with administrative privileges to successfully install the service described in step 4 above. With Windows Vista and higher, even if you are logged in as an administrator by default you do not have administrative privileges when launching an application. To run an application in an administrative mode, you will have to right click on the application icon and select "Run as an administrator". To workaround the issue, you will need to open a command window as an Administrator. To do so, click on Start and search for "cmd". Right-click on "cmd.exe" and select the option "Run as Administrator". From this command window, you will be able to run all of the necessary batch files at administrative level. Several of the configuration files expect the folder C:/temp to exist. If it does not, you may receive "Null Pointer Exception" errors from the SoloManager application. Either modify the service.conf and solomanager.ini files or create the folder as needed. which is the default Solo_Predictor sub-folder in which the 64-bit version of Java is located. If Solo_Predictor is installed in a location other than the default folder, or you are using the 32-bit version of Solo_Predictor, change this value to reflect the correct location. For 32-bit Solo_Predictor, replace "win64" with "win32". An alternative solution to the above issue is to execute the service with the credentials of a specific user that has a full copy of Java installed. To resolve this issue, go to the windows "Services" control panel, locate the EVRI SoloManager service, double-click the service and change the "Log On" properties to a specified user. to see if the server will start when run manually. Errors from this script can be used to adjust the service.conf file. Copy solomanager.ini into the daemon_linux folder. This copy of solomanager.ini will be used by the daemon. Run the Install_Daemon script to install the daemon (this batch file must be run by a user with root privileges). to see if the server will start when run manually. A) your Solo_Predictor executable. See the steps and example SoloManager.ini file above. In particular, check that "startExecutableCommandPre" and "executableName" identify your Solo_Predictor executable. B) the SoloManager log file, SoloManagerLog.txt, will be created in the folder identified in the SoloManager.ini at the line "outdir". This is very useful for identifying the cause of any problems. Make sure the identified folder exists. C) "serverIP" and "serverPort" are correct for your Solo_Predictor (check its default.xml file). D) Be sure to leave "nResponseReboot" = -1 to prevent SoloManager rebooting your computer, until you are ready to give it that ability. 2. Check that java is identified in your service/conf/service.conf file​, as described in the third bullet-point under "Troubleshooting_Windows_Service_Problems​" above. 3. Now try starting SoloManager manually by double-clicking on the SoloManager.jar file. This should start Solo_Predictor for you and keep it running. So you should see the Solo_Predictor start-up splash screen appear and Solo_Predictor run. If it does not start successfully then examine the contents of the "SoloManagerLog.txt" file in the folder you specified for "outdir". This page was last modified on 20 March 2019, at 23:57.